Remember “The Pause”? There Wasn’t One. But we Knew That. The United Nations panel of climate science experts mentioned it in a 2013 report, scientists have published more than 200 papers analyzing it, and climate deniers said it was proof that climate change didn’t exist, but in reality the global warming “pause” or “hiatus” never occurred. “In hindsight, with current GMST [Global Mean Surface Temperature] datasets, there is no statistical evidence for a ‘pause,'” concluded one of the two studies, which reassessed temperature monitoring from the late 1990s and early 2000s. “There was a natural slowdown in the rate of warming during roughly the decade of the 2000s due to a combination of volcanic influences and internal climate variability, but there was no actual ‘hiatus’ or ‘pause’ in warming,” Michael Mann, director of the Earth System Science Center at Pennsylvania State University and an author of the climate modeling study, said. I clobbered Senator Ted Cruz for his parroting of the “pause” talking point. It’s long been obvious that if there had been any blip in the trends it was temporary. The years that followed have hit new temperature records. 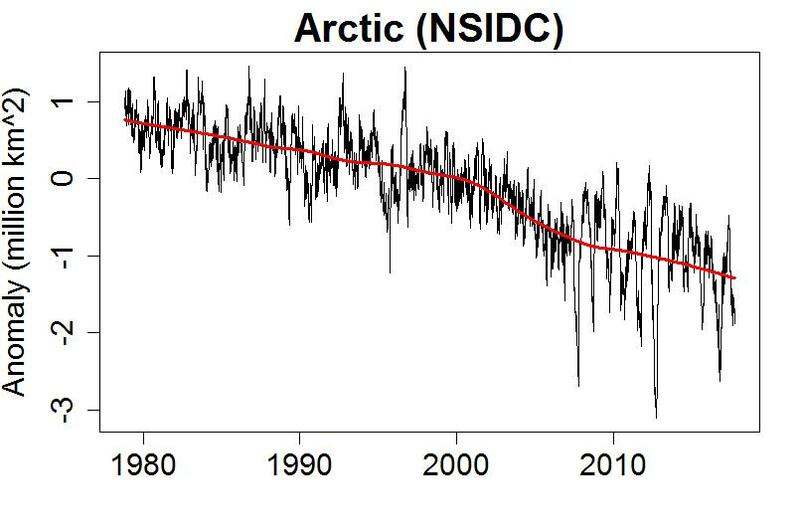 Scientists know, for example, that the Arctic is warming at a faster rate than the planet as a whole, but there weren’t enough temperature observations from the Arctic in the early 2000s to accurately measure the changes that were occurring there. As a result, data sets on global temperature tended to omit the Arctic until recently, when researchers came up with a better way to extrapolate data from the region. “We simply didn’t have all the information available at the time,” Stephan Lewandowsky, a researcher at the University of Bristol and lead author of the climate modeling report said. Natural phenomena, including increased volcanic activity and decreased solar activity, also masked human-caused warming during the late ’90s and early 2000s, seemingly deviating from what climate models had projected, Lewandowsky said. I interviewed an all star panel on this in 2013. There are tons of studies arguing that the 1998-2012 “hiatus” was a result of fluctuation. But the amplitudes of fluctuation are also getting larger with the rising amout of energy in the climate system. More energy pulling on mother nature’s forces makes the oscillation larger. My 50 cents. You might be right about the oscillation increasing. Tamino was pointing out the same thing, regarding Arctic sea ice, at his Open Mind blog. I saw a general talk on this topic a few years ago. I don’t recall whether any reason was hypothesized but it was noted that systems in general that are moving from one steady state to another tend to have increasingly large fluctuations until they switch. Sort of like a giant “hit and miss” engine—-gets “goofy” just before it stops and then the various governors/feedbacks get it going again. Anyway, the “hiatus” is history and we’ve seen temperatures rising in giant steps. We won’t hear the end of it. The 2016 +1.55C will be the new start point for climate denialists…. This one is playing with the semantics because Wally Broecker’s global warming with its diverse collection of amateurish definitions doesn’t ever include OHC anomaly. Still the coal/oil shills likely haven’t obtained an enforceable copyright on playing with words for the best for their team so it’s all fair game if that’s what interests you. If you’re interested in actual physical science I’ve already pointed you to what happened and it started 1990 AD (I think that might even be on Cheng’s OHC plot). « So, What is a Green New Deal?